In the activity titled “Faraday Pickup,” students used copper wire, nails, tape, and batteries to build electromagnets. Each circuit was tested to see which team maximized the strength of the electromagnets by picking up the highest number paper clips from the table. For “Raft in Dire Straits,” the students designed and built rafts made of foil. The goal of this activity was to make each boat strong enough to hold a heavy load without sinking. 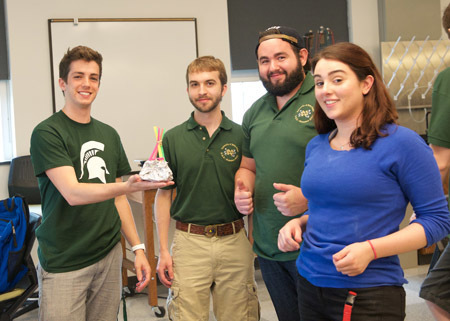 In the third event, “Bungee Madness,” students used sandbags and rubber bands to build miniature bungees. They considered the sandbag weight, elasticity of the bungee cord, and distance from the balcony to the ground floor. They then released the sandbags, bringing them as close as possible to the floor without touching it. Highlights from this year’s Physics Olympics can be seen in the video below. Originally published by Jayme Russell at science.nd.edu on June 23, 2015.